The Delaware Valley Regional Planning Commission is the federally designated Metropolitan Planning Organization for a diverse nine-county region in two states: Bucks, Chester, Delaware, Montgomery, and Philadelphia in Pennsylvania; and Burlington, Camden, Gloucester, and Mercer in New Jersey. 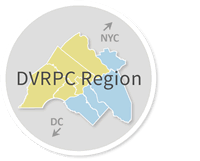 DVRPC’s mission is to achieve this vision by convening the widest array of partners to inform and facilitate data-driven decision-making. We are engaged across the region, and strive to be leaders and innovators, exploring new ideas and creating best practices.